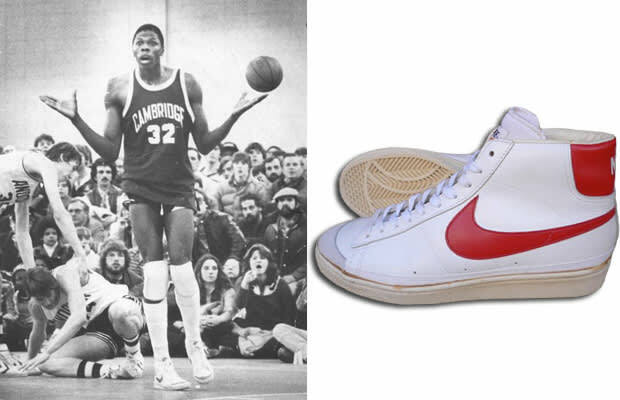 The Nike Franchise Hi was one of only a handfull of basketball sneakers released by Nike in the time period of 1972-1980. Though these early Nikes kept Ewing fresh, they weren't enough to spare him ridicule, which was due in large part to his strong Jamaican accent. Opposing crowds frequently taunted Pat with creative (we love sarcasm) signs stating "Ewing can't read." His profound response? "But I sure can count. And someday I'm going to be in the pros and counting my money all the way to the bank!" "I have a B.A. in Fine Arts from Georgetown" is something Ewing would probably have said a few years later.